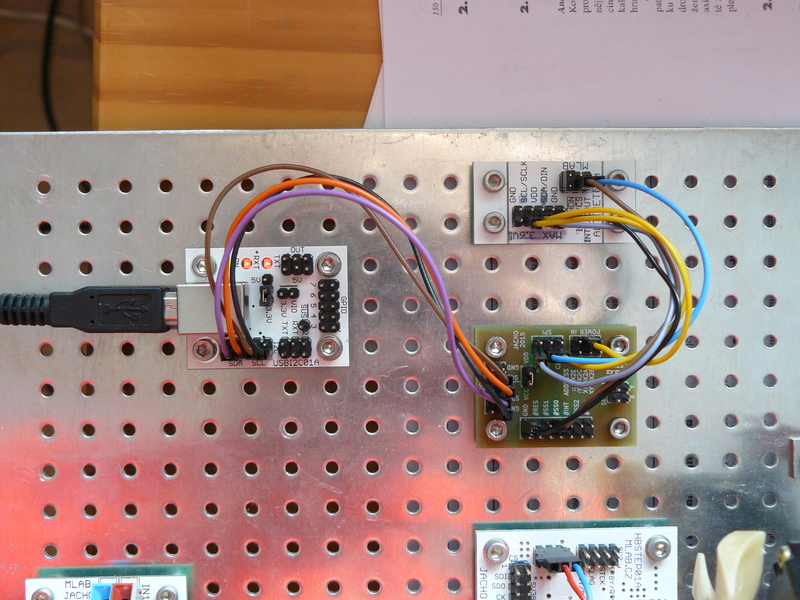 The module allows controling of SPI devices by I²C bus. Therefore is possible to control SPI devices trought Pymlab library. I²C address can be selected from several addresses by jumpers configuration or by placement of resistors soldered on PCB. If configuration of addess is changed, the new adderess will by active after power-on reset. The module is connected to the I²C bus by standard MLAB pinheader connector. If connected propertly the module can be seen by i2cdetect utility. I2CSPI module is present at bus with address 0x2E. Converter module can be controlled from Python by Pymlab library. It allows connection to the USB to I2C converter thus the control is possible from every system by HIDAPI standard. An example of use SPI communication over I²C is prepared in library sources. The example uses barometric altimeter module ALTIMET with SPI variant of sensor MPL115A1.